king of Scotland, of the house of Stuart, was born in 1394. In 1405 his father Robert III. sent him to France, in order that he might escape the dangers to which he was exposed from his uncle the duke of Albany, but being taken by an English squadron, he and his whole suite were carried prisoners to the Tower of London. Here the young prince received an excellent education, to which Henry IV. of England was remarkably attentive, thereby making some atonement for his injustice in | detaining him. Sir John Pelham, a man of worth and learning was appointed his governor, under whose tuition he made so rapid a progress, that he soon became a prodigy of talents and accomplishments. Robert died in the following year, and James was proclaimed king, but during the remainder of the reign of Henry IV. and the whole of that of Henry V. he was kept in confinement, with a view of preventing the strength of Scotland from being united to that of France against the English arms. 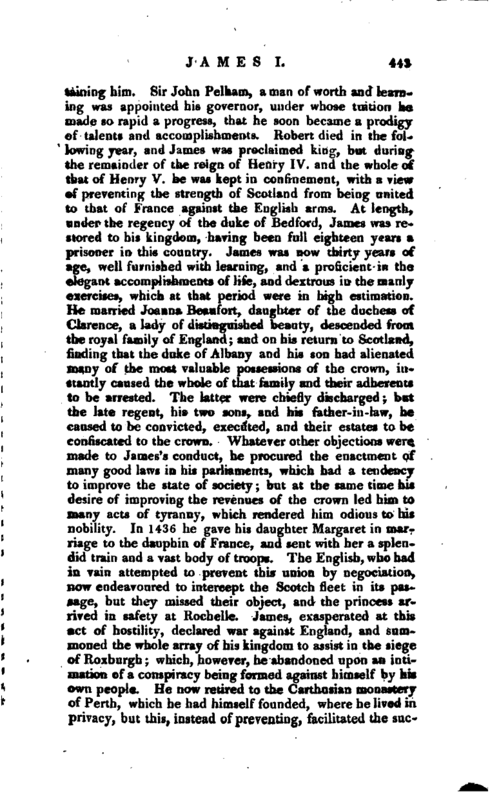 At length, under the regency of the duke of Bedford, James was restored to his kingdom, having been full eighteen years a prisoner in this country. James was now thirty years of age, well furnished with learning, and a proficient in the elegant accomplishments of life, and dextrous in the manly exercises, which at that period were in high estimation. He married Joanna Beaufort, daughter of the duchess of Clarence, a lady of distinguished beauty, descended from the royal family of England; and on his return to Scotland, finding that the dujte of Albany and his son had alienated many of the most valuable possessions of the crown, instantly caused the whole of that family and their adherents to be arrested. The latter were chiefly discharged; but the late regent, his two sons, and his father-in-law, he caused to be convicted, executed, and their estates to be confiscated to the crown. 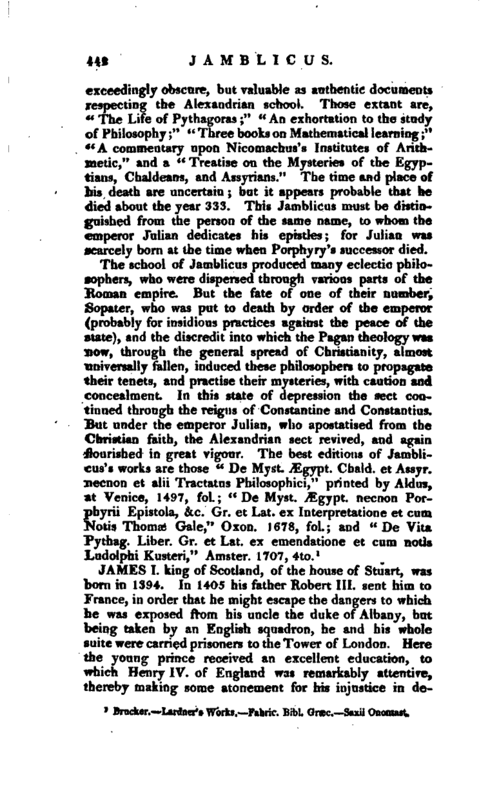 Whatever other objections were made to James’s conduct, he procured the enactment of many good laws in his parliaments, which had a tendency to improve the state of society; but at the same time his desire of improving the revenues of the crown led him to many acts of tyranny, which rendered him odious to his nobility. In 1436 he gave his daughter Margaret in marriage to the dauphin of France, and sent with her a splendid train and a vast body of troops. The English, who had in vain attempted to prevent this union by negociation, now endeavoured to intercept the Scotch fleet in its passage, but they missed their object, and the princess arrived in safety at Rochelle. 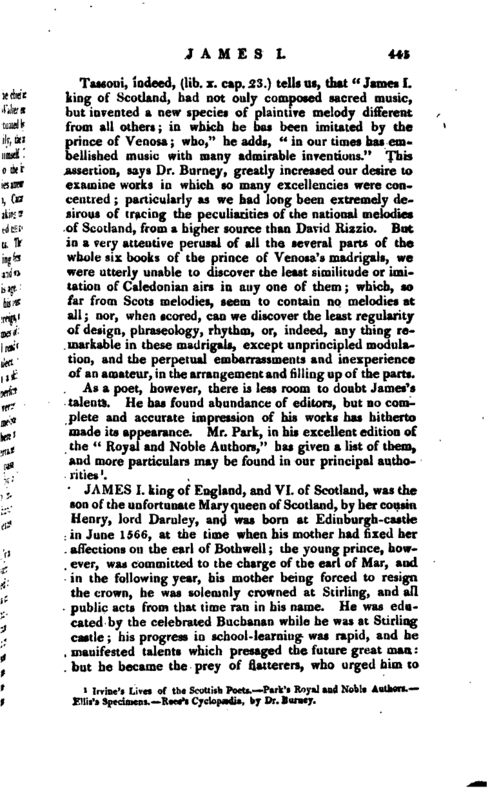 James, exasperated at this act of hostility, declared war against England, and summoned the whole array of his kingdom to assist in the siege of Roxburgh; which, however, he abandoned upon an intimation of a conspiracy being formed against himself by his own people. He now retired to the Carthusian monastery of Perth, which he had himself founded, where he lived in privacy, but this, instead of preventing, facilitated the | suecess of the plot formed against his life. The chief actors in this tragedy were Robert Graham, and Walter earl of Athol, the king’s uncle. The former was actuated by revenge for the sufferings of some of his family, the latter by the hope of obtaining the crown for himself. The assassins obtained by bribery admission into the king’s apartments; the alarm was raised, and the ladies attempted to secure the chamber-door; one of them, Catharine Douglas, thrust her arm through a staple, making therewith a sort of bar, in which state she remained till it was dreadfully broken by the force of the assailants. The instant they got admission, they dragged the king from his concealment, and put him to death with a thousand wounds on Feb. 20, 1437, in the forty-fourth year of his age. He is introduced in this work chiefly on account of his literary reputation, for he was a poet as well as a sovereign, and his works, descriptive of the manners and pastimes of the age, were once extremely popular, and are still read with delight by those who can relish the northern dialect. 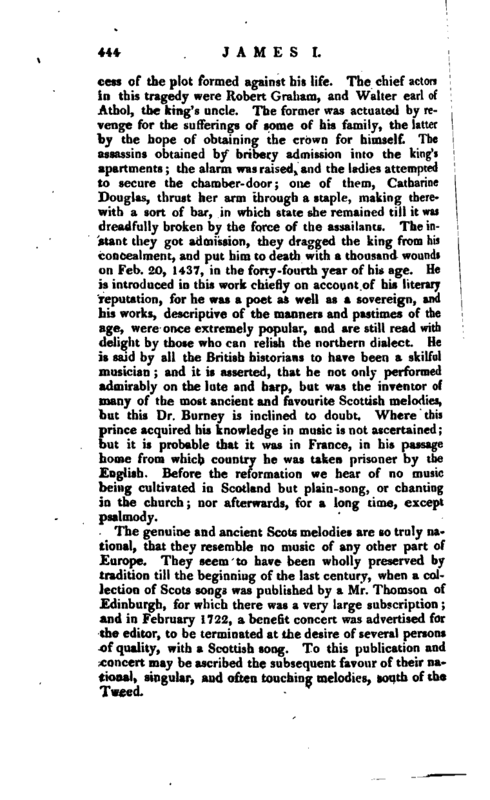 He is said by all the British historians to have been a skilful musician; and it is asserted, that he not only performed admirably on the lute and harp, but was the inventor of many of the most ancient and favourite Scottish melodies, but this Dr. Burney is inclined to doubt. Where this prince acquired his knowledge in music is not ascertained; but it is probable that it was in France, in his passage home from which country he was taken prisoner by the English. Before the reformation we hear of no music being cultivated in Scotland but plain-song, or chanting in the church; nor afterwards, for a long time, except psalmody.